What if I were to tell you that there are 16 thinking habits that will make you smarter? After all, there are money habits that will make you richer, eating habits that will make you healthier, and working habits that will make you more productive. Why not thinking habits that will make you smarter? The habits you’ll discover below are known as “the 16 habits of mind”; they were identified by Arthur L. Costa, Ed. D. and Bena Kallick, Ph.D. These thinking habits are attributes that people exhibit when they’re behaving intelligently. 1. Persistence. Persistence is the ability to remain focused on a task, and to follow through to completion. It’s sticking to a problem and refusing to give up easily. People who persist have a strategy for attacking problems. They try different approaches systematically, they gather feedback and analyze what’s working and what’s not, and they change their approach accordingly. Persistence requires being comfortable with ambiguity and being able to persevere through disappointment. People who persist keep looking for ways to achieve their goals even when they feel stuck. 2. Managing Impulsivity. Managing impulsivity is about being able to deny impulses in favor of achieving an important goal. Effective thinkers think before they act. Instead of simply reacting to external stimuli, they reflect on the different options available and choose the one that they consider to be the most likely to get them what they want. Managing impulsivity is closely related to self-discipline. It’s about taking your time, and remaining calm, thoughtful, and deliberate. 3. Listening With Understanding and Empathy. Listening with understanding and empathy is paying close attention to what is being said beneath the words. It’s about devoting mental energy to other people’s thoughts and ideas, respecting the point of view of others, and trying to understand where they’re coming from—or putting yourself in their shoes. 4. Thinking Flexibility. Thinking flexibly is having the ability to look at a problem from several different angles and perspectives. People who are mentally flexible have the ability to consider multiple points of view. In addition, they can change their minds when they receive additional data or reasoning which is contrary to their original conclusion. 5. 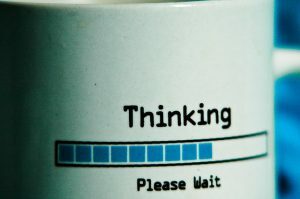 Thinking About Thinking (Metacognition). Thinking about thinking is having the ability to stand outside of yourself and observe your own thoughts. It’s being able to see how what you think affects what you do and the outcomes that you get. In addition, it’s noticing how others are affected by your actions. Intelligent people evaluate the quality of their thinking skills. If they conclude that they’re making thinking errors, they look for strategies to remedy those errors. Lastly, metacognition is being aware of your feelings and emotions. 6. Striving for Accuracy. Striving for accuracy is to “measure twice before you cut”” in order to minimize your chances of making a mistake. It’s learning the rules, checking for errors, and paying attention to detail. In addition, it’s taking pride in your work and striving for excellence. People who strive for accuracy set high standards and they’re always looking for ways to master their craft. It’s having a questioning attitude and looking for problems to solve. 8. Applying Past Knowledge to New Situations. Applying past knowledge to new situations is basically learning from experience. In addition, it’s being able to make analogies and having the ability to apply knowledge outside of the situation in which it was learned, that is, in another context. 9. Thinking and Communicating with Clarity and Precision. Language and thinking are closely entwined, and language refinement plays a critical role in enhancing a person’s ability to think. Intelligent people strive to be clear when speaking and writing; they take care to use precise language and use correct names and labels. People who think and communicate with clarity avoid generalizations and distortions. 10. Gathering Data Through All Senses. Information is taken in through the senses. The more acute your senses are, the higher the quality of the information that you’re taking in. In addition, when you’re trying to learn something new, try to use as many of your senses as you can. For example, if you’re learning about music, listen to the piece you’re learning about, observe a musician playing it, touch the musical instrument, and feel the vibrations the music makes. In addition, you can even try to play it yourself. Intelligent people pay attention to the world they live in, and they engage with it using all their senses. 11. Creating: Imagining; Innovating. Everyone has the ability to be creative, but a lot of people discredit their creativity. Intelligent people have the ability to generate ideas, depart from the norm, and be original. Being creative is noticing new connections, being willing to try new things, looking for novel solutions to problems, and pushing the boundaries of what was previously thought possible. 12. Responding with Wonderment and Awe. The brightest people have a passion for what they do. Their primary focus isn’t to receive external rewards, but to feel the thrill of creating and problem solving, and the exhilaration of learning new things. When solving problems, intelligent people are intrigued by the possibilities and they have fun with it! 13. Taking Responsible Risks. Taking responsible risks is about being willing to try new things, and not being afraid of failure. It’s about constantly stepping outside of your comfort zone and living on the edge of your competence. Intelligent people take on challenges and see risk-taking as an adventure. However, they only take educated risks: that is, those risks which experience suggests are worth taking. 14. Finding Humor. Finding humor is about being able to laugh at yourself and recognizing the whimsical, the incongruous, and the ironic. People with a good sense of humor have the ability to look at things from an original vantage point. They enjoy the unexpected. In addition, laughter fosters creativity and problem solving, it has health benefits, and it helps to create bonds with others. 15. Thinking Interdependently. No man, or woman, is an island. In order to achieve your full potential, you have to have the ability to get along with and work with others. No one has access to all of the data available, no one knows it all, and no one has the ability to consider all points of view. Thinking interdependently is having the ability to do all of the following: cooperate with others; build on the ideas of others; accept constructive criticism of your ideas by other people; and make concessions to achieve results. 16. Remaining Open to Continuous Learning. Intelligent people are always in learning mode. They’re constantly looking for new ways of doing things and striving for self-improvement. Their quest for knowledge is never-ending. Intelligent people resist complacency and they can admit when they don’t know something. The 16 thinking habits, or habits of mind, allow you to do the smart thing even when you’re not sure what to do. Start applying these habits and watch yourself getting smarter. And the smarter you are, the more likely it is that you’ll be able to create and live your best life. I enjoyed this Marelisa. Prior to reading this, I was listening to a YT video by Miranda Macpherson and she was talking about surrender, supporting, opening to the unknown and all the things that brings one towards oneness and love. Being in that zone, I receive this article and see how, miraculously, the items you discussed fits right into that paradigm. Underlying all of these ways of thinking, is the surrender to the moment and the resistance to get entangled with ego. Thank you for this. It took what is a spiritual metaphysical topic and funneled it into reality. Hi Sandy: It’s interesting that you say that because recently I’ve been thinking of something that I call “pragmatic spiritualism”. It’s taking spiritual concepts and transforming them into concrete steps you can take to live those spiritual concepts. So, it’s like you say: funneling them into reality. I think that is a fantastic idea. Spirituality is still woo woo to many and I think that is why so many don’t apply the principles. They don’t know how it breaks down and therefore have no clue how to measure what their actions.